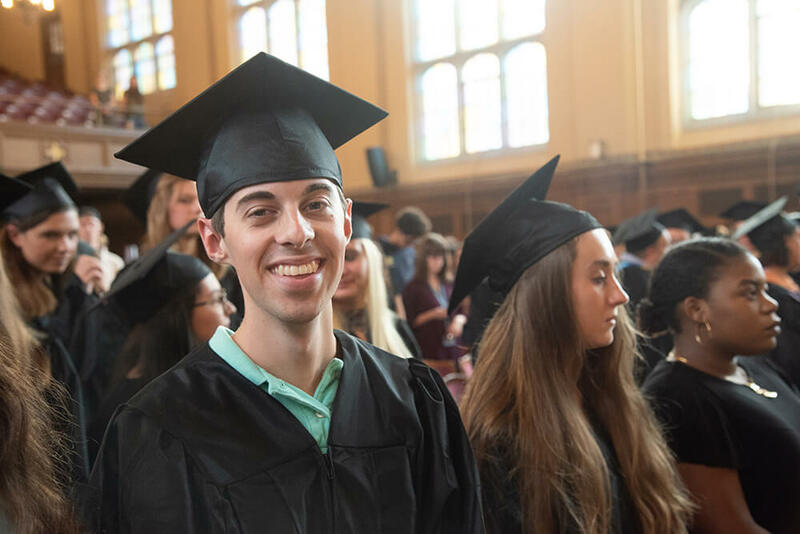 Senior Andrew Belliveau ’18 is approaching a career as a teacher from a unique angle, connecting his personal experience managing a disability with a message of empowerment. Today’s special education teachers often have students with different types of mild to moderate special needs, such as Asperger’s Syndrome/high-functioning autism, autism spectrum disorder, attention deficit hyperactivity disorder, cognitive delays, emotional/behavior disorders, learning disabilities, moderate cognitive impairment, and traumatic brain injury. We teach you to understand and implement instruction and strategies for students with mild to moderate special needs; assess physical, emotional, intellectual, and social development in childhood and adolescence; and provide developmentally appropriate learning experiences, especially in language development, that connect students’ interests with their life experiences. Our program prepares teachers to work with students with moderate special needs in pre-kindergarten to grade eight or grades five to 12. Candidates for licensure complete comprehensive coursework and related field experiences with students with moderate special needs in schools and other settings. Implement appropriate instruction and strategies for students with mild to moderate disabilities, incorporating relevant curriculum frameworks. Apply theories and methodologies in assessing physical, emotional, intellectual, and social development in childhood and adolescence. Provide developmentally-appropriate learning experiences – especially language development experiences – that connect students’ interests with their life experiences. Significant emphasis is placed on language development, language acquisition, vocabulary development, multiple approaches to reading, and extending the relationship of writing and reading. Prepare, implement, and evaluate I.E.P.s and understand/demonstrate role responsibilities as case manager. Apply federal and state laws/regulations related to special education and serve as local resources to other agencies that might provide related services. Facilitate/collaborate in the design or modification of curriculum and instructional materials and support general education classroom environments for students with mild to moderate disabilities. Assist in preparing and monitoring students with moderate disabilities for appropriate general education classrooms. Initial teaching licenses earned at Elms College qualify candidates to begin teaching in Massachusetts and more than 40 states, islands, and territories.